Walking through the rooms in the apartment where Miksa Róth once lived is a strange experience, as the man who spent his life making stunning stained glass windows and intricate mosaics in a myriad colours, apparently chose to live in surroundings that were entirely in shades of brown. The bedroom, dining room and living room where the Róth family resided in Nefelejcs utca near Keleti Station have been preserved and restored to show visitors exactly how life was at the turn of the century. Róth’s work can be seen in other rooms and the vivid colours, patterns and luscious designs of the glasswork and mosaics contrast with his day to day living conditions, the browns and beiges of the flocked wallpaper, tables, chairs, curtains and bed linen. ”After 10 years of expert work and dedication I think we can finally say we have a home worthy of the name of Miksa Róth,” said Mihály Ráday, head of the City Protection Association at the opening of the memorial house and museum. Zoltán Szabó, Mayor of District VII said the collection contained “unparalleled value” but that more financial support would be needed to achieve the dream of creating a stained glass centre. Born in 1865, Miksa Róth was 19 years old when he took over his father Zsigmond’s workshop and the craft of glass painting was still in its infancy. In 1855 English glass workers succeeded in creating an "antique glass" effect. This coloured glass was suitable for the repair and restoration of the windows of medieval churches, as well as for decorating the new romantic, and the historically eclectic designs. By 1880, workshops were sprouting up in the capital, the most significant of which belonged to Miksa Róth, who at the turn of the century was providing work for 10 trainees, working on both public and private building commissions. Miksa Róth’s first significant work was in 1886 in Máriafalva (Mariasdorf, Austria) where Imre Steindl was leading the reconstruction of the Roman Catholic church. Earlier Róth had studied the stained glass windows of Gothic cathedrals on a tour of Europe. During the reconstruction of many other national monuments, Róth designed Gothic stained glass windows at Keszthely for the reconstruction of the Roman Catholic church led by Samu Pecz (architect of the main market hall in Budapest) in 1896.
prepared in 1890. Róth took into account both the staircase’s light source and the building’s interior decoration, and decided to use the Grotesque style originating from the Renaissance period. 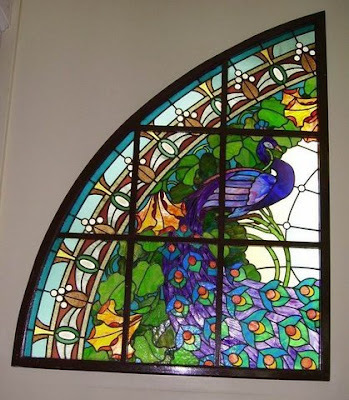 Reflecting the multi-coloured nature of Hungarian architecture at the turn of the century, Róth created windows in many styles: Historic, Hungarian Secession, Art Nouveau, Jugenstil and Viennese Secession. iridescent colours and an immediately popular natural marbling effect of the glass. glass painter Karl Engelbrecht, and began to regularly order glass from his factory. 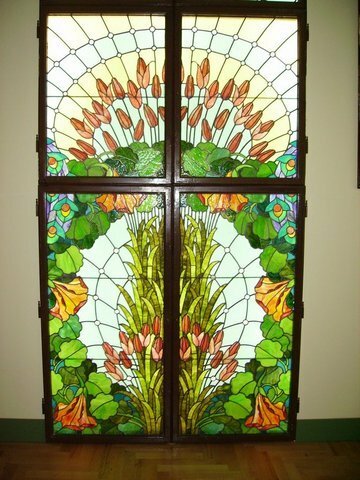 At the 1898 Budapest Museum of Applied Arts’ Christmas Exhibition Róth displayed glass windows prepared using a type of Tiffany glass, seen for the first time in the Austro-Hungarian monarchy. 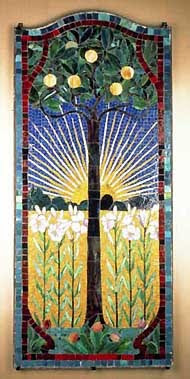 Róth won the silver medal at the Paris World Exhibition in 1900 with the Pax and Rising Sun mosaics made with opalescent glass. 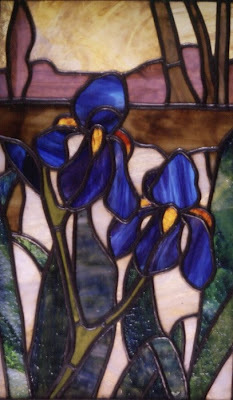 The Róth workshop then made a large number of stained glass windows with floral designs, whose success could be attributed to the nostalgia felt by people living then in large cities for the lost world of nature. In Budapest the stairwells and lifts were brightened up with luxuriant gardens in place of the drab partition walls and dark corridors. Middle class citizens even decorated their parlours with the symbolic motives of flowers: Irises, lilies, sunflowers, poppies and roses, birds such as peacocks and swans, and fauns, nymphs, fairies and female figures frolicking in gardens, arbours and riverbanks to recall the lost period of the Golden Age. One of Róth’s most significant creations using opalescent glass was for cupola of the Teatro Nacional in Mexico City, which he carried out according to designs by Géza Maróti.With this work he showed details of geometric design of the Jugenstil and Viennese Secession which he also used in windows for Bank Building (1905 Ignác Alpár), the Gresham Palace (1907 Zsigmond Quittner and József Vágó) and the Music Academy (1907 Flóris Korb and Kálmán Giergl) . Róth worked with many of the best architects, builders and designers of the time. For Ödön Lechner's magnificent Post Office Savings Bank building, Róth created an unusual mosaic, embedded into cement. In 1910, Róth created the gorgeous windows of the Culture Palace in Marosvásárhely (Targu Mures in Romania). In the Hall of Mirrors, scenes from traditional Székely fairy tales, ballads and legends are featured in the 12 stained glass windows which fill the entire length of the long hall. It is worth a visit to Marosvásárhely alone to stand among these magical and colourful designs. Marosvásárhely Culture House triptych, also based on Nagy’s designs, Róth used a special medieval technique, employing thick leading and strong lines. From the 1920s Róth mainly received commissions from the Church and State. He died in 1944 after a lifetime of bringing joy and colour to the world with his beautiful creations. Miksa Roth died in 1944 after a lifetime of bringing joy and colour to the world with his beautiful creations. Beautiful words written about a talented man. I would be a happy person if this was said of me when I'm gone!! My hope is to inspire others to find joy in colourful creations. Enjoyed the visit to the Miksa Roth Memorial House. Kind staff who take all time to give information. Hope you will raise new funds for restauration of the workshop. Richard, the Netherlands.